Takeshi Kitano, better known under his acting pseudonym “Beat” Takeshi, is a man of many, many talents. He’s a skilled writer, author, screenwriter, painter, director, presenter, poet but more than anything else, in Japan he was known as a comedian – as part of the comic double act The Two Beats, and for hosting shows such as Takeshi’s Castle. So it was a bit of a surprise when, in 1983, he starred in war drama Merry Christmas, Mr Lawrence. His film career began to explode when he starred and directed Violent Cop, the story of which seems pretty self-evident, and a number of other slow, dramatic and violent films such as Sonatine, Boiling Point, Hana-Bi, and so on. Western Audiences, myself included, probably got their first taste of Kitano when he played the ruthless teacher in Battle Royale, and assumed he was never a really goofy, light-hearted kind of person. These two drastically different views on Kitano come neatly together in his 2003 film Zatoichi. A reboot of sorts of the wildly popular chanbara-genre Zatoichi films of the 60s and 70s, about a blind masseur who is also a master swordsman, this was the last film he directed before his trilogy of surreal pseudo-autobiographies, and was Kitano winking at the audience, telling us that beneath all the darkness and violence was the same genre-savvy renaissance man we know and love. In the film, Ichi (or Zatoichi, played by Beat Takeshi), finds himself in a village oppressed by a gang lord, like villages in chanbara films are prone to be. He decides to stay and protect the villagers from the gang war that is brewing, and befriends farmer Ume (Michiyo Okusu), and her dopey gambler nephew Shinkichi (Guadalcanal Taka). Meanwhile, a ronin (Tadanobu Asano) accepts a position as bodyguard for the yakuza, in order to support his sick wife (Yui Natsukawa), and two Geisha (Daigoro Tachibana and Yuko Daike) return to the village to exact revenge on the gangsters who killed their family. There’s a lot of plot here to go around, and Kitano tells all three stories well, intertwining them with each other to make it work as one big plot. Usually a film with so many threads can unravel quite quickly, but here it’s told as if every story affects the others, which they do. The ronin Hattori’s tale is probably the most detached from the rest of them, and so happens to be the one with the least time dedicated to it. It’s small, but effective in showing that the people who work for Ginzo (Ittoku Kishibe) aren’t necessarily horrible people. Hattori is a man without a choice, who does what he does because he’s good at it. The geisha’s story is more mixed in with Zatoichi’s, and because they spend a lot of time with him, they blend in better and feel more connected to the larger story. All three would be very entertaining by themselves, but together, they work towards a bigger picture, about what it takes to live in this time. If this sounds a bit too dark and hard-hitting, worry not. Winking to Kitano’s manzai past, Zatoichi is sprinkled with small comedic moments all over the place, from the rice farmers dancing to the soundtrack, making almost Stomp-like sounds to the rhythm, to the affable idiot who lives next door and wants to be samurai, but just runs around the house screaming at the top of his lungs. Kitano knows that the world isn’t all doom and gloom, and that there are funny moments even when your village is under siege, and is he willing to bend the rules a bit to make his film stand out a bit more. The film ends with a fantastic 8-minute long tap dancing sequence. The blood is stylized CG (and the swords are sometimes too, and boy have they not aged well). 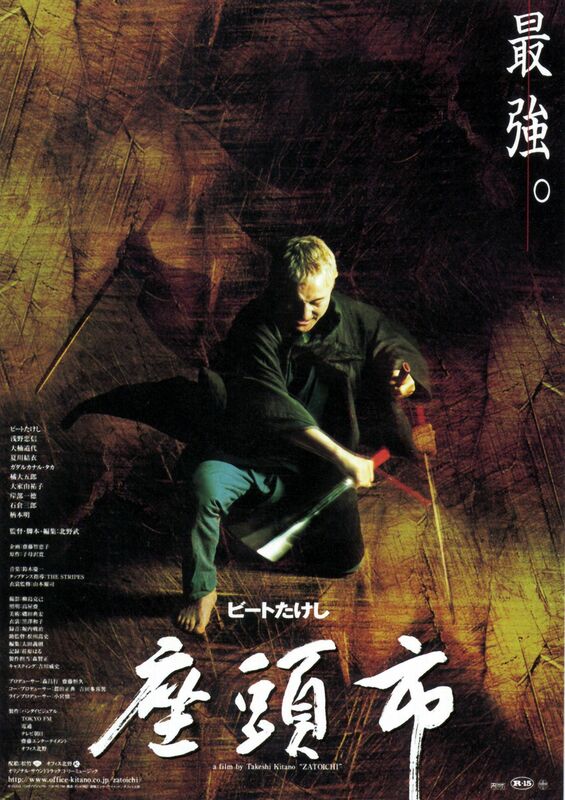 Zatoichi walks around with peroxide white hair, and a bright red cane – as a means of separating this incarnation with the previous series both visually and stylistically. While keeping true to the spirit of the genre, he spins it his own modern way, which is a risky move. Not everyone can pull it off but Takeshi Kitano makes it one of the strongest and most recognizable aspects of the film. The lightness takes the edge off a film that would otherwise be two hours of misery, violence, revenge and people trying to kill a blind guy. Part of what makes Zatoichi so entertaining is the cast, who all pull their weight and allow the film to have this rich palette of emotion and tone, though it’s true that this only applies to the main cast. Ginzo, the primary villain, doesn’t have a lot going for him outside of the simple role of yakuza boss and his existence is only there for the geisha to grow their characters from. Likewise with Hattori’s wife Shino. When she isn’t telling him not to go back to his old life, she isn’t on screen. Her purpose begins and ends with the ronin. But in a way, that’s fine. The main cast consists of six already – more would clutter the film too much and drag it on for hours. It stands as its own film, without any prior knowledge of the series, and serves as a great introduction to the character of Zatoichi. Chances are you’ll get a lot of enjoyment out of this, even if you’re not too into samurai films. Verdict: There’s a bit of everything for everyone here, from the man who seems to be able to do it all.